Tease. So you’ll keep coming back to see the finished painting. Scroll down to see timelapse #11. Yes, I’m being such a tease, showing you parts of the canvas in these wip photos. Partly it’s because this painting could take me 2 weeks to do, and it would get boring if I didn’t try to show you something different each day. And partly it’s because I’m hoping for a big reveal once the painting is done. I hope the photographer who took the original photograph, Dani Devaux, will like the finished painting. But this is not a commission, so I could still interpret it how I want. For example, so far I have not been concerned with catching the likeness of the model. And I’m thinking of having her eyes closed in the painting, though they were open in the photograph. I think the closed eyes suits the peaceful environment and meditative pose. Late start today, even though I slept well, had a good breakfast. It’s due to my addiction. I just couldn’t shake myself free, and get down to work. And of course, as a Mom I also had the meals, laundry, helping kids with h.w. etc. sprinkled into the mix. My addiction? Binge-watching everything on Netflix. To the point where Netflix could blackmail me by threatening to share my watch history with the world, because it’s so extensive, so eclectic. In fact the other day I had to wonder if Netflix was throwing me some shade. It recommended a category, based on my recent viewing habits, called “Soapy International Dramas for Hopeless Romantics”! I’ve always enjoyed watching foreign films, in the original language, but with English subtitles. I understand just enough French and Spanish to realize that a lot can be lost in translation. Low budget movies that have been dubbed into English are the worst. I like to listen to the actors speaking in their own voices, to hear the tone and nuance. It is like a ladder to a window into another world, where I can experience the lifestyle of people who walk in wildly different shoes than mine. From the comfort of my own couch. Last year I watched a few Turkish romantic drama series, and a strange thing started to happen. The Turkish responses for certain situations would come into my head, before I could answer in English – simple things like thank you, good night! When I was younger I used to love to curl up with a big book, the bigger the better because it lasted longer. And it’s the same thing with watching a series, the characters become very familiar. And it’s like having company in the studio. That’s how it works with shows in English. The problem is, you can’t watch a show with subtitles and paint at the same time. So far during this challenge, I’ve been listening to podcasts while I paint. It was working great, but then this morning I was watching a Korean series and I just didn’t want to stop. Eventually I compromised and put on a movie in English, and watched that while I painted. By the time it was over, I was deep into the painting, so I was able to carry on with nothing else playing in the background. My plan for this week is to go to the library and pick up an audio book or two to try out. Yeah, yeah, I know. First world studio problems. Usually synthetic brushes are recommended for use with acrylic paints. But a person’s art is a sum of the myriad of choices they make along the way, from materials, to equipment, to technique etc. The combination of these things can be quite unique for an artist, it’s like their artistic fingerprint. It’s how you can pick out one artist’s work from the rest. Their style. For many years I have found that cheap hog’s hair, or bristle brushes are the best choice for the way I work. I do a lot of scumbling – applying paint with a dry brush – because I like to apply paint in layers to make the surface more interesting. The technique is too hard on synthetic brushes, they quickly lose their ability to hold a point/edge. The natural bristle brushes wear down, but they still hold together quite well. I’ve found I have different uses for them as they go through the various stages of being worn down. The reference photo I am using for this painting, is from an amazing St. Lucian photographer, Dani Devaux. I have followed Dani on social media for years, her photos are beautiful, professional, and I especially love her portraits outdoors in the lush St. Lucian landscape. Then a few months ago she posted an image that fit in well with a theme I wanted to explore in my art. So I asked for her permission to paint from her photo, and she ended up sending me two that I loved. Right away I transferred the images to canvases, but then I had to wait until I was ready to begin the series. It is a pleasure to be working from such great photography. Check out Dani’s website www.danidevaux.com. Subscribe to my blog so that you can see the rest of my 30 painting timelapse videos in 30 days challenge. 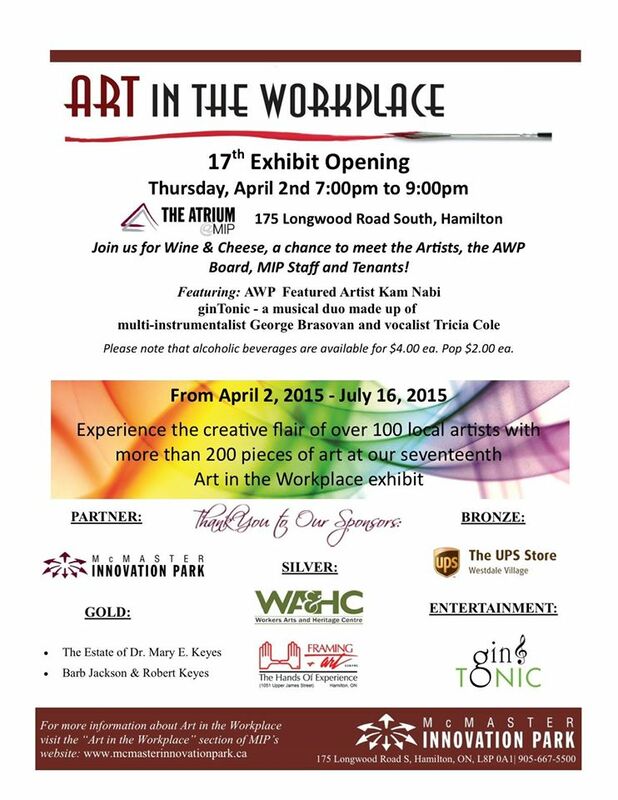 If you live in Hamilton & surrounding area, then come join me at the wine & cheese art opening tomorrow night at McMaster Innovation Park! This is the 17th juried exhibition put on by MIP, and several of the artists I know have participated before, and they’ve encouraged me to enter. So, I did, and I’m excited to see the following 2 paintings on display tomorrow, along with a great selection of art by a variety of local artists. 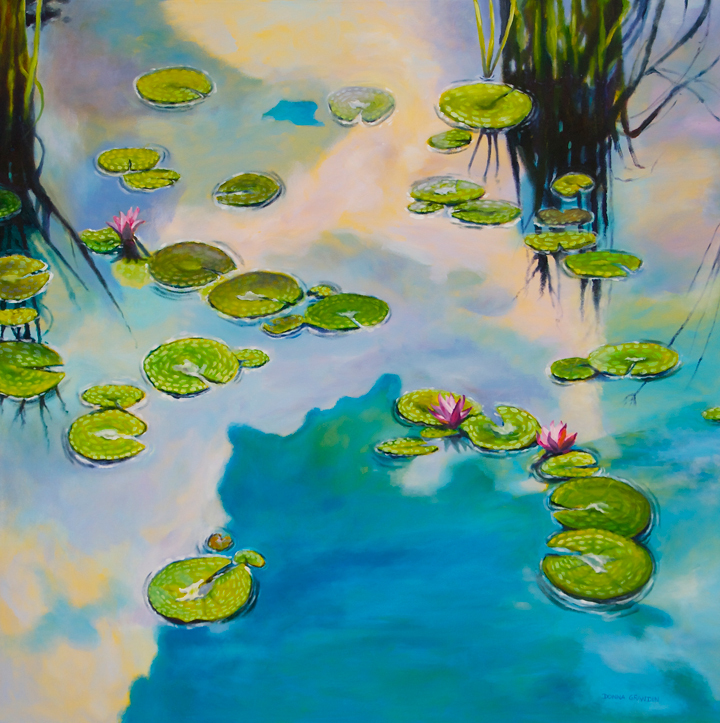 Pond Life, 30″x40″, acrylic on canvas, © Donna Grandin, 2013. $1800. 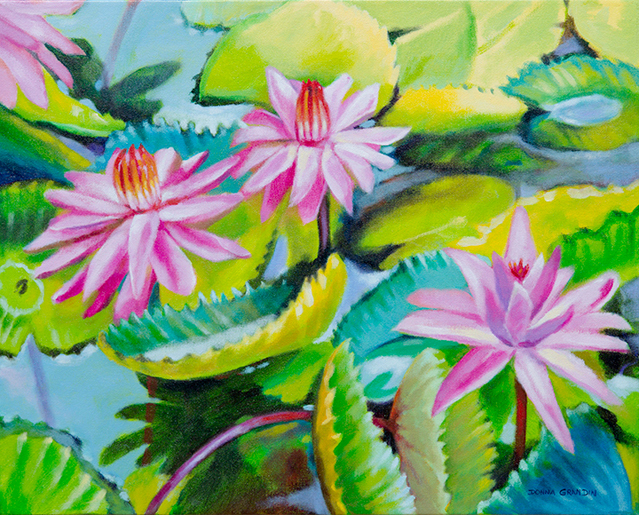 If you’d like some fresh art to enliven your home, or workplace for Spring … come take a look at the selection available! I also have another painting done at the same time (see below), but it is in my studio, so if you’re interested, e-mail donna@bluerootsartstudio.com. 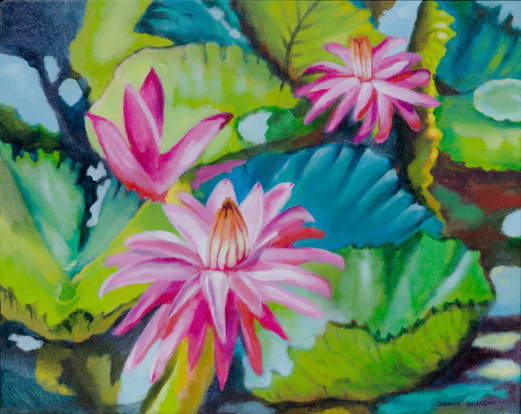 Water lily drama, 16″x20″, acrylic on canvas, © 2013 Donna Grandin. $700. Hamilton – 8 Square, 337 Sketch Gallery, 337 Ottawa St. N, Opens April 10th 7-9pm, continues till May 2. Group exhibition, all works 8″x8″ and $300. Burlington, ON – SpringPop, a pop-up art market organized by No Vacency. That will be April 17-19. 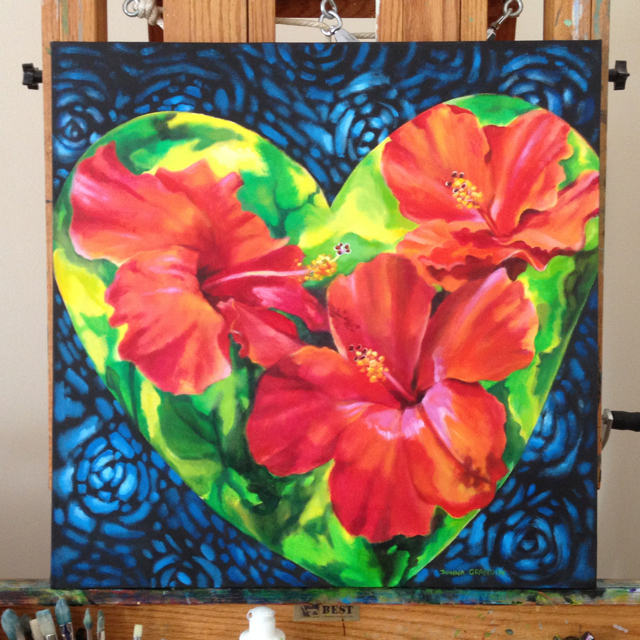 Painted Valentine, 24″x24″, acrylic on canvas, ©2015 Donna Grandin. CDN$1100. Happy Valentine’s Day! Here is a little something I’ve been working on, to show my appreciation to those who support me in this love affair I have with painting. 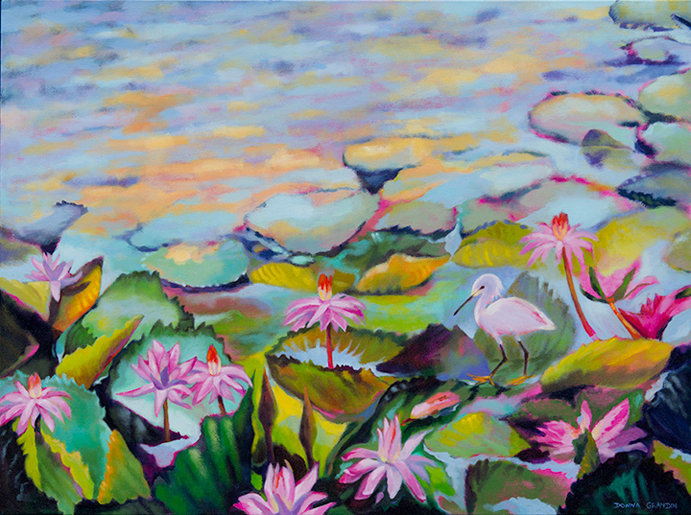 Hot off the easel … ok, on the easel right now. This painting, and a few others that I’ve been working on since my last post, will go to the photographer soon, then I’ll post the official photographs when he gives them to me. As you can see, I’ve continued exploring the blue patterning that started out in my fernscapes and peacock abstractions. I’m having fun trying out different ways to incorporate it in my painting. In this case I started out just placing random strokes of blue, but quickly saw the potential for a floral pattern and so took it in that direction. This is the first time the background is so separate from the rest of the image, but I’m enjoying the boldness of this painting, it’s strong, cheerful and romantic. If you have fallen in love with this painting, and want to bring it home to live with you, be the first to contact me about it at donna@bluerootsartstudio.com. 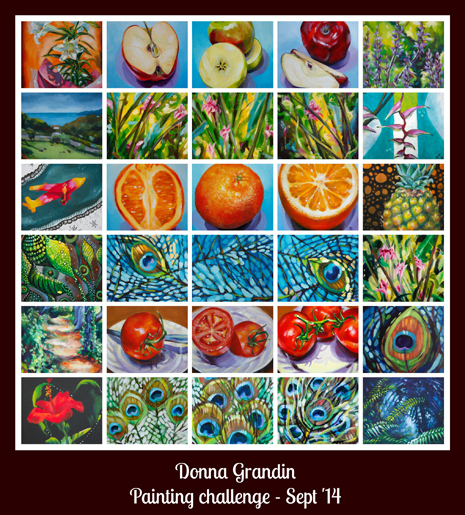 The thinking place, 48″x48″, acrylic on canvas, ©2014 Donna Grandin. $2400. Free shipping (unstretched canvas rolled in mailing tube), or local delivery until end of January. Here is another painting I forgot to write about, I completed it just in time for the Art in Action Studio Tour. It’s another large painting – 4’x4′ – so far this one and Gemma’s Rose have just sat in my studio while I went about creating more paintings. I will have to see about getting them out into the public eye soon … but right now I have a number of other irons in the fire. In The thinking place, you can see I was exploring the use of dashes of colour, like I used in my peacock paintings. There is just something playful about the juxtaposition of whimsical pattern with a realistic scene, that makes me happy. I love the peacefulness of this scene, such a great place to sit and contemplate, either the real location, or just facing the painting. I think it reminds you to slow down, take the time to enjoy Nature, stare at the clouds, the ripples in the water, the beautiful flowers. 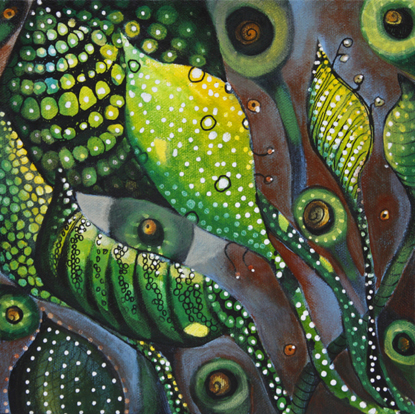 Let me know if you’d like to try this painting out in your house to see how it transforms your space. 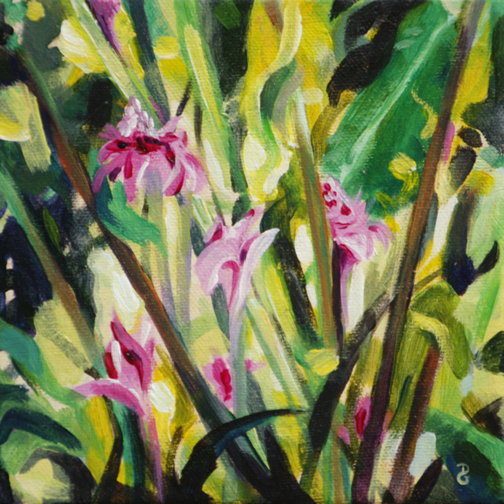 If you live nearby, I can bring a selection of paintings for you to choose from. With a small business like mine (one short individual wearing lots of hats), you are guaranteed the personal touch! Collage of “30 paintings in 30 days challenge”, Sept ’14. Here is a collage to show the paintings I submitted (created) for Leslie Saeta’s 30 paintings in 30 days challenge. Take a look at the collages some of the other participating artists posted today! I only painted 22 or so new paintings during that time, because I took the last week off to spend some time with my brother and his wife who were visiting from London, England, AND to prepare/participate in Culture Days Burlington. Still, I am very happy with what I did accomplish, considering all what I had going on during those 3 weeks. If I had just said I was too busy to take on the challenge, I would have completed far fewer paintings. IF you have been following my blog, you may be wondering how the Culture Days event went … for now I’ll just say it went great! I want to touch up my painting a little before posting though. Meanwhile, here is a video clip promoting Culture in Burlington, I make a 2 second cameo about halfway … you might recognize the paintings behind me! If you are in the Burlington, Ontario area you will see some of my 30 in 30 paintings in my studio during the Art in Action Studio tour, Nov 1 &2. They are also available online. No, you did not enter the Twilight Zone! I painted this playful little piece a few months ago when I discovered paint markers, and I wanted to explore pattern. It was fun, but I was not sure how it fit in with my body of work, so I tucked it away somewhere in my studio. There was a point when I was embarrassed by my “experiments”, and after photographing them, I would gesso over the image and reuse the canvas. Now when I look back, I realize that these little paintings are stepping stones, and seen individually as little islands they may not make a lot of sense, but from a distance (or rather, in time) we can see how they link up to create a path. My work, in general has been evolving in the last 2 years, and I have been laying down more and more stepping stones. Finally, I am starting to connect them, and I am really excited about the direction I am moving in. There is still a lot of work to do, but I have a vision now of where I want to go. Eventually I will do a post to show the progression of this idea, but for now let me just say that this “Surreal Garden” full of alien looking plants was the step before the peacock paintings.